Institute of Literature of the National Academy of Sciences of Ukraine (Інститут літератури ім. Т.Г. Шевченка національної академії наук України; Instytut literatury im. T.H. Shevchenka Natrionalnoi akademii nauk Ukrainy). A research institute where research on the history of Ukrainian literature, particularly on the works of Taras Shevchenko, is conducted and published. It was founded in Kharkiv in 1926 as the Taras Shevchenko Scientific Research Institute. A proposal to create this type of an institute at the All-Ukrainian Academy of Sciences in Kyiv was made originally by Serhii Yefremov, but the institute was initially attached to the People's Commissariat of Education and placed under the direction of party writers—Serhii Pylypenko, Volodymyr Koriak, and Andrii Richytsky. Prominent literary specialists such as S. Yefremov, Oleksander Doroshkevych, Borys Yakubsky, Pavlo Fylypovych, Volodymyr Miiakovsky, Volodymyr Derzhavyn, Viktor Petrov, and Mykola Plevako took part in the institute’s projects and publications until the late 1920s. The first director was Dmytro Bahalii (1926–32). During the first few years of the institute’s existence, significant research on Shevchenko was carried out, but in the early 1930s his works began to be falsified to fit preconceived interpretations, as exemplified by the writings of Yevhen Shabliovsky, who was appointed director of the institute in 1934. This practice culminated in the tendentious doctrine that Shevchenko was a ‘revolutionary democrat’ and a disciple of Vissarion Belinsky, Nikolai Chernyshevsky, and other Russian thinkers. In 1936 the institute was transferred from the Commissariat of Education to the Academy of Sciences of the Ukrainian SSR in Kyiv and called the Shevchenko Institute of Ukrainian Literature. The poet Pavlo Tychyna was appointed director. In 1944 he was replaced by the scholar Oleksander Biletsky. In 1941, after the German invasion, the institute was evacuated to Ufa, where it was part of the Institute of Language and Literature of the Academy of Sciences of the Ukrainian SSR until it was moved back to Kyiv in 1944. In 1952 it was renamed into the Taras Shevchenko Institute of Literature of the Academy of Sciences of the Ukrainian SSR (since 1994 of the National Academy of Sciences of Ukraine). From 1944 the institute has been the co-ordinating center for all literary studies in Soviet Ukraine. Besides the 1939 five-volume and the 1949 ten-volume collections of Taras Shevchenko’s works, the institute published numerous monographs and collections on Shevchenko by Dmytro Kosaryk, Ivan Pilhuk, Yevhen Nenadkevych, Yevhen Kyryliuk, Yevhen Shabliovsky, Oleksander Biletsky, Oleksander Deich, and others. The political bias of many of these studies diminishes considerably their scholarly value. The same is true of the studies that were published on the centenary of Ivan Franko’s birth in 1955 by Mykhailo Vozniak and in 1956 by O. Biletsky, I. Bass, Oleksander Kyselov, and others. Possessing a huge collection of manuscripts (over 100,000), after the Second World War the institute published a series of ‘collected’ works by Ukraine’s classical writers: Vasyl Stefanyk (3 volumes, 1949–54), Lesia Ukrainka (5 volumes, 1951–6 and 12 volumes, 1975–9), Ivan Kotliarevsky (2 volumes, 1952–3), Panas Myrny (5 volumes, 1954–6), Marko Vovchok (6 volumes, 1955–6), and Ivan Franko (20 volumes, 1950–6). Unfortunately, the selection of materials was at times falsified or bowdlerized and the introductions and commentaries in these collections were often incomplete and tendentious in their approach. While Oleksander Biletsky was the director (1944–61), one could perceive in the institute’s publications an obvious attempt to view the history of Ukrainian literature in relation to the development of world literature. Under the directors Mykola Shamota (1961–78) and Ihor Dzeverin (1978–1991), however, the party line was reaffirmed and, in general, research of a propagandistic, rather than scholarly, nature was published, focusing on the theory of socialist realism, the guiding influence of Russian literature on Ukrainian literature, and the like. The preparation of surveys and textbooks of Ukrainian literature has been a central function of the institute. A Chrestomathy of Old Ukrainian Literature (published in 1949, 1952, and 1967) and a two-volume history of Ukrainian literature (edited by Oleksander Biletsky and others, published in 1950) were ready for publication in 1941, but did not appear because of the war. Serhii Maslov and Yevhen Kyryliuk’s Narys istoriï ukraïns'koï literatury (Outline History of Ukrainian Literature, 1945) was criticized harshly in 1946 for being ‘nationalistic’ and was withdrawn from circulation. In 1954 a new outline history in Ukrainian and Russian appeared. Adhering to the Stalinist conception of Ukrainian culture, it gave a completely distorted account of the development of Ukrainian literature. The first volume of Istoriia ukraïns'koï literatury (A History of Ukrainian Literature, eds O. Biletsky, Mykhailo Bernshtein, and Mykola Gudzii, 1954) was written in the same spirit. The second volume, dealing with the Soviet period, avoided mentioning many banned and repressed writers; its account of the early Soviet period was so poor and incomplete that the volume was withdrawn from circulation and extensively revised before being republished in 1957. An eight-volume (nine-book) history of Ukrainian literature was published between 1967 and 1971, and a two-volume history appeared in 1987–88. One of the largest projects planned by the institute, in collaboration with the publishers of the Ukrainian Soviet Encyclopedia, was the publication of a five-volume Ukrainian Literature Encyclopedia, but only three volumes were published (1988–95). The institute also completed the publication of 50 volumes of Ivan Franko’s works (1976–86). Since the late 1980s the institute has prioritized the study of the early twentieth-century Ukrainian literature, especially the so-called Executed Renaissance, as well as the legacy of the Shistdesiatnyky (Sixtiers) generation and Soviet dissident poets such as Vasyl Stus. Numerous works of the writers who perished during the Stalinist terror or whose works were inaccessible to readers during Soviet rule have been republished. Among them have been novels, short stories, and memoirs of Volodymyr Vynnychenko; the first full edition of Mykola Khvylovy’s works to appear in Ukraine (2 volumes, 1991); the fullest edition of poetic and critical writings of Mykola Zerov (2 volumes, 1990) and his scholarship (in the anthology Ukraïns'ke pys'menstvo [Ukrainian Writing], 2003, edited by Mykola Sulyma); and selected works of Vasyl Stus (4 volumes, 1994–99, and the planned 12 volume edition [as of today, 5 volumes have been published in 2007–09]). The institute has also began publishing the complete works of Taras Shevchenko in twelve volumes (6 volumes have been published in 2001–2014). Another ongoing project has been the new twelve-volume Istoriia ukraïns'koï literatury (A History of Ukrainian Literature, 2 volumes were published in 2012–13). One of the most significant achievements of the last few decades has been the comprehensive Shevchenkivs'ka entsyklopediia (The Shevchenko Encyclopaedia, 6 volumes, 2012–15), the most up-to-date source of information about Shevchenko’s life and work, which also contains entries about Shevchenko scholarship, translators, and artists who were inspired by the poet. Over the years the institute has expanded significantly. Appointed in 1991, Mykola Zhulynsky has been the longest serving head of the institute. As of 2017 the institute consists of seven sections: manuscript collections and textual criticisms; the history of Ukrainian literature; the twentieth-century Ukrainian literature and contemporary literary process; Taras Shevchenko studies; literary theory and comparative literature; world literature; and scholarly information. It also contains several scholarly centers, including that of American studies; German studies; Far Eastern studies; and fantasy fiction. The institute has a staff of around 120 scholars, among them three academicians and two corresponding members of the National Academy of Sciences of Ukraine. Since 1991 the following areas of study have been of particular significance: the studies of Taras Shevchenko’s legacy (Valeria Smilianska, Serhii Halchenko, Oleksandr Boron, Stepan Zakharkin); medieval and early modern Ukrainian literature (Mykola Sulyma, Volodymyr Krekoten, Yurii Peleshenko); early Soviet Ukrainian literature (Raisa Movchan, Yurii Kovaliv, Valentyna Kharkhun, Yaryna Tsymbal); the Shistdesiatnyky generation (Liudmyla Tarnashynska); and theoretical issues of modern Ukrainian literature in comparative context (Hryhorii Syvokin, Tamara Hundorova, Halyna Syvachenko, Dmytro Nalyvaiko, Dmytro Zatonsky, Solomiia Pavlychko). 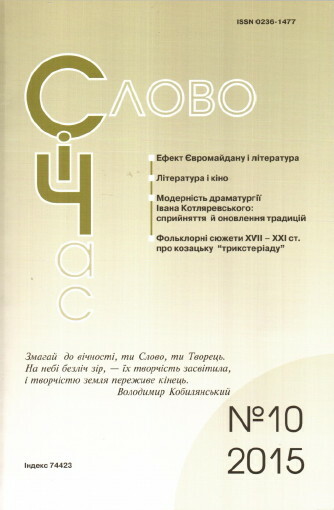 Since 1938 the institute has published Radians’ke literaturoznavstvo as its official periodical (since 1957 as a monthly journal), in 1990 renamed to Slovo i chas. Other periodicals and series include the literary historical yearbook Spadshchyna: Literaturne dzhereloznavstvo, tekstolohiia (10 volumes, 2004–15), Hoholeznavchi studiï (20 volumes, 1996–2013), and Literaturna komparatyvistyka (4 volumes, 2005–11) among others. From the end of the Second World War until 2011 a branch of the institute was located in Lviv, where scholars such as Mykhailo Vozniak, Filaret Kolessa, Kyrylo Studynsky, and Vasyl Shchurat worked during its early years. From 1948 to 1965 this branch published twelve collections of articles and materials on Ivan Franko. Among the most significant achievements of the Lviv scholars during the last two decades has been the publication of additional volumes to the 50-volume collected works of Ivan Franko (51–54 vols, 2008–10). In 2011 the Lviv branch was reorganized in the Ivan Franko Institute of the National Academy of Sciences of Ukraine. Since 1991 the branch (and since 2011 the Ivan Franko Institute) has been headed by Yevhen Nakhlik.